Samsung has launched its 360 gear with the release of Galaxy S7 and Samsung S7 Edge, although Samsung is not a well known name in the world of VR gadgets but still few people use to prefer this brand especially, whereas on the other side LG 360 cam was launched to work in association with all Android as well as OS devices. Both of these cameras have almost same kind of features so people are not able to decide easily that which one to buy; definitely they need a reliable comparison between both gadgets so that better decision can be made. Actually there is some different between image and video quality that you must know along with few other major features. Cons Big size so you cannot keep it in pocket For uploading your videos to facebook and YouTube, you may need desktop application. When we watch 360 videos on tablet or smartphone then it leads to immersive experience; a facility of VR headset can add more features to your 360 video world. In case of Gear 360 you will be able to enjoy 4K resolution whereas LG 360 serves with 2K resolution only thus Samsung Gear 360 will be better choice in this case. On the other side if we talk about audio abilities then LG360 has an edge over Samsung Gear 360 because of its ability to record 5.1 level surround sounds that is major requirement of a 360 degree video. The Gear 360 possess stereo record feature that can capture voice only in two directions thus resultant audio in scenes is not that much clear. Moving forward to more technical specifications, the bit rate – well known as quality of image with resolution is 60MB/second in case of Gear 360 whereas LG360 cam limits up to 19MB/second, this makes a big difference in quality. If we count features then Samsung gear 360 definitely have more features as like its waterproof body, highly stabilized video results and F2.0 dual lenses but LG360 lacks behind in these features. It is possible to stitch videos as well as photographs taken from the 360 degree camera using Galaxy phone and they can be directly shared on social media. Some consumers also love to use Desktop software to edit the camera results in detail. Same as like Gear 360, the latest device from LG can also capture good quality 360 degree videos as well as photographs but it do not support spherical share as like Samsung unit. You can pair up LG360 cam only with LG G5 latest smartphone whereas video and photo editing options are not yet known for smartphone as well as PC. Both these devices come with Wi-Fi connectivity, USB port and Bluetooth capabilities whereas in case of Samsung 360 gear NFC is an additional option. The ultimate combination of time lapse recording, 360 spherical recording and loop recording makes everything easy in Samsung gear where you can avail wonderful results for each real time recording. Price difference of both devices is well reflected in the comparison table above and you got enough information about their features too. 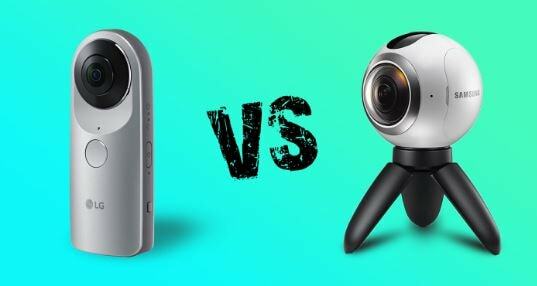 The gear 360 results better looking images along with better color distributions but in case of LG the image as well as video quality is comparatively degraded; Although, LG cam is much faster and discrete design but for professional photographers it will not result better output. The two additional shooting modes of Gear 360 also allows better quality of videos and its compatibility with Samsung smartphones allows easy editing and uploading. After getting real time users recommendations and their reviews, users are advised to prefer Samsung GEAR 360 for their Virtual Reality needs but those who cannot compromise for price range can go for LG360 device as its audio quality is much better than Samsung gear 360 along with ability to connect with Android as well as iOS devices.